Michele Martin, host, NPR’s Tell Me More. Pamela Paul, author of Parenting, Inc.
“Finally, a book about college admissions that gets it right. Amen! 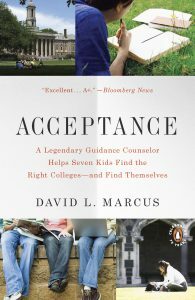 This is a “must-read” for anyone who wants to preserve the college admissions process as a positive growth experience and not one that leaves the applicant emotionally fragile, exhausted and ultimately cynical about education itself.